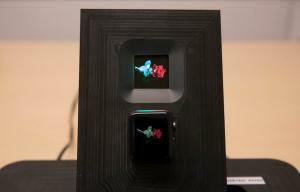 Glo also demonstrated a MicroLED microdisplay, produced on a silicon CMOS backplane. In this configuration Glo achieves a high density display (1000 PPI) that can produce up to 100,000 nits brightness. Glo's CEO, Fariba Danesh, explained to us that Glo developed technology that covers the whole aspect of MicroLED design, manufacture and integration - it produces In-Ga-N LED chips that can be placed on either LTPS backplanes or CMOS ones and can scale from 1.8um to 20 um. Glo targets all display types - from microdisplays through mobile displays and up to TV panels. Glo also developed transfer technology - and in total has been awarded over 200 patents. Glo is a fabless operation - it has an manufacturing agreement with one of the world's largest LED makers to produce its microLED chips and it has also signed an agreement with one of the world's largest display makers to produce the actual MicroLED panels.